Trinita Farmer, mother of police homicide victim, Tashii Brown, holds back her tears after attending court where the defense announced they would need more time on the grand jury decision. On May 14, 2017, Tashii Brown was at the Venetian Hotel & Casino when he suffered a mental breakdown while under the influence of methamphetamine and asked two Las Vegas Metropolitan Police officers for help. Officer Kenneth Lopera began chasing Brown and ended up tasing him seven times before punching Brown in the head multiple times and then putting him in an illegal choke-hold. According to the Coroner’s Office findings, the cause of death was asphyxiation. LVMPD stated that Brown would not have been charged with a crime if he survived the attack. January 24, 2018, Las Vegas, NV. “He was very creative,” said Trinita Farmer about her son, Tashii Brown, during an interview in her home on March 4, 2018. Farmer was eager to exhibit his work, which included several designer baseball caps, and blueprints of shoe and logo designs. A shrine she had for Brown in her bedroom displayed five original hat designs, a framed photo of Brown posing and looking up, which would later become inspiration for the official design of The Tashii Brown Movement, a developing grassroots effort led by Farmer to keep her son’s name alive. Stuck into the corners of the photo frame were portraits of his young son and daughter. Hibiscus flowers and leis framed the shrine, and the Hawaiian touch could be seen all around the home. 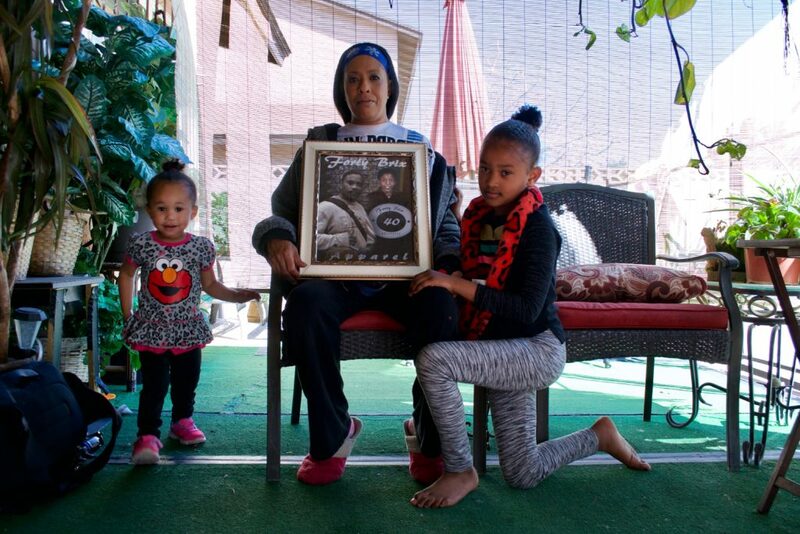 Trinita Farmer poses with her framed photo collage of her son, Tashii Brown, along with her two granddaughters, in her home. March 4, 2018, Las Vegas, NV. Brown, a 40-year old African American man, had just relocated to Las Vegas from Hawaii, in hopes to find work and send money back to his two children. Shortly after he arrived, Brown was killed by Officer Kenneth Lopera of the Las Vegas Metropolitan Police Department. On May 14th, 2017, Brown was in The Venetian Hotel & Casino. Under the influence of methamphetamine, a drug that can cause paranoia and hallucinations, Brown believed he was being chased by someone who wanted to hurt him. When he saw two LVMPD officers by a coffee shop inside the casino, he ran to them for help, not knowing his nightmare was about to materialize. Rather than providing him with assistance, calming him down and de-escalating the situation, Lopera began chasing Brown on foot. Brown ran through an employee corridor and into the parking garage. When Lopera caught up with Brown who was at a standstill, Lopera tased Brown which caused him to fall down onto the ground and onto his back. In the bodycam footage you can hear Lopera yelling at him repeatedly to, “get on his stomach.” Brown, whose both hands were visibly empty and in front of him kept saying, “I will, I will,” but Lopera continued to tase him which made it difficult for Brown to turn over onto his stomach. As Lopera continued to tase him, multiple officers arrived at the scene and began forcibly turning Brown on his stomach, who appeared to be writhing in pain from the taser. Lopera punched Brown’s head repeatedly, and then placed him in an unapproved martial arts chokehold. When a senior officer commanded Lopera to let him go, he refused and continued to choke Brown. The bodycam video concludes with a view right upon Brown’s head as he laid lifeless on the ground. Lopera tased Brown a total of seven times, punched Brown over ten times, and placed him in a chokehold for a minute and thirteen seconds. 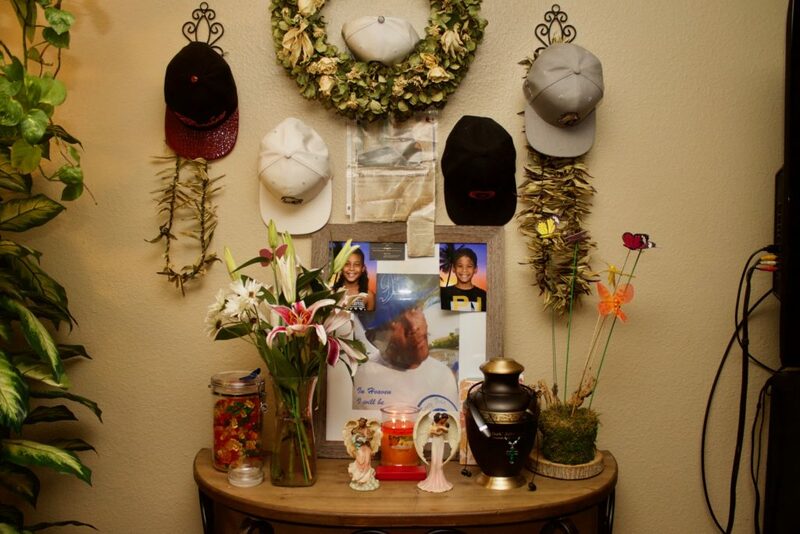 Trinita Farmer’s shrine to her son, Tashii Brown, in her bedroom. Leis and hibiscus flowers are traditional items of decor in Hawaii where Farmer’s family is from. Brown was a jack of all trades who had many artistic talents and interests. He designed hats, shirts and shoes and was an expert skateboarder. His portrait is in the center surrounded by his two young children who reside in Hawaii. Brown had relocated to Las Vegas with plans to make money so that he could support his children. March 4, 2018, Las Vegas, NV. The Clark County coroner’s office’s ruling stated that Brown died of asphyxiation and was deemed a homicide. 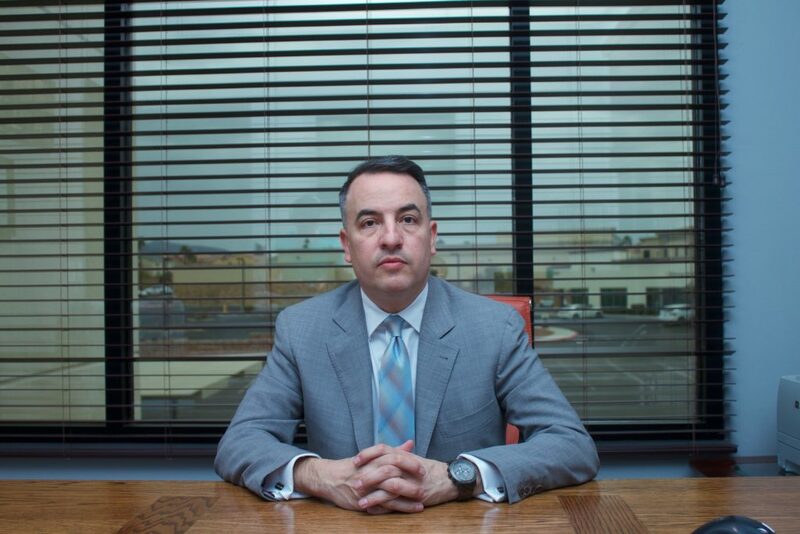 Less than a month later, Clark County District Attorney, Steve Wolfson, indicted Lopera with the charges of involuntary manslaughter and oppression under the color of office. Lopera was suspended by the department without pay (and ultimately fired), and faced up to eight years in state prison. However, by Wolfson’s choice, who in his six years as district attorney has passed on prosecuting any of the 45 officer-involved shootings, referred the Brown case to a grand jury, a secret proceeding that is controversial in police shooting cases. In 2015, grand jury proceedings were banned from the state of California, due to the public’s overwhelming concern that the proceeding is ineffective in making just decisions due to its secrecy and the establishment’s interest in protecting the police. Both grand juries in the cases of the Eric Garner and Michael Brown found no reason to indict the officers who killed them. Andre Lagomarsino, Trinita Farmer’s lawyer, poses for a photo after an extensive interview on the Tashii Brown case. Due to the shock and trauma of losing her son, Farmer had a difficult time telling the story of what happened to Brown. Lagomarsino agreed to be interviewed so that he could speak for her. He expressed that he feels very confident about the case. March 10, 2018, Las Vegas, NV. In the case of Tashii Brown, the grand jury decision was continually postponed for 6 months. This frustrated Farmer tremendously who stopped attending the monthly status checks due to the detrimental effect they had on her health. In the time since her son’s death, Trinita has endured job and significant income loss, and has had to relocate. 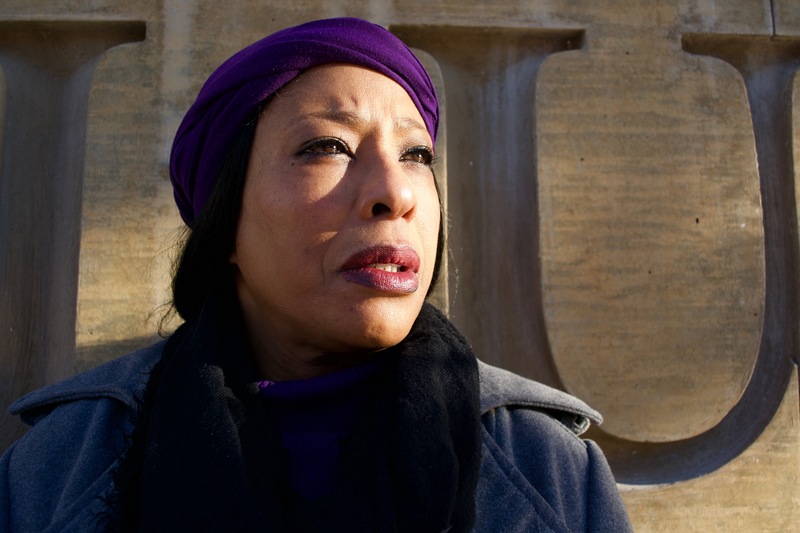 The trauma of being a police homicide survivor has caused her health to suffer tremendously and she is constantly in and out of the doctor’s office. 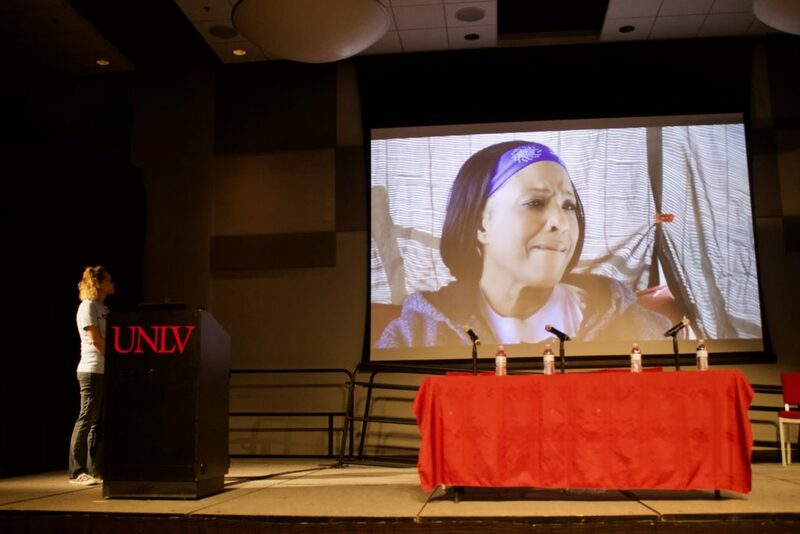 Trinita Farmer, the mother of police homicide victim Tashii Brown, is featured on Forced Trajectory Project’s Residuum, a multimedia vignette series about the impact police violence, and screened at the UNLV Center for Social Justice’s Radical Consciousness Conference hosted at the Student Union. Karintha Fenley, a contributor to Forced Trajectory Project and a board member of Families United 4 Justice, a growing nationwide collective of families impacted by police violence, introduces the series to the audience. April 13, 2018, Las Vegas NV. Last Thursday, July 26, 2018, the grand jury decision not to indict Lopera was released. 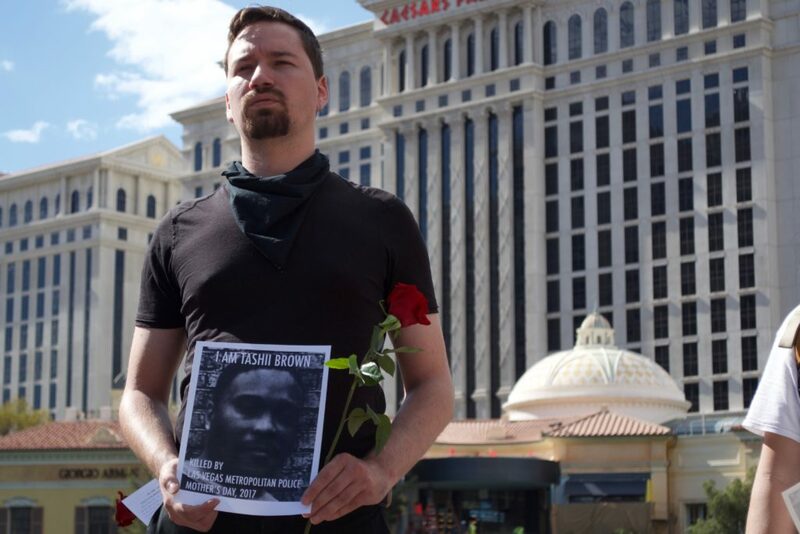 This came as a shock to Farmer, her lawyer, Andre Lagomarsino, the Las Vegas Valley civil and human rights community, and local media outlets who have consistently reported on the Brown case. The Las Vegas Review Journal revealed that Wolfson and his prosecutors sent the Brown case to be reviewed by the Force Science Institute, an organization of trained professionals in the field who teach use of force classes to police departments and like organizations. When asked about their record in officer-involved-shootings, Force Science was unable to recall even one case where they did not side with the police. 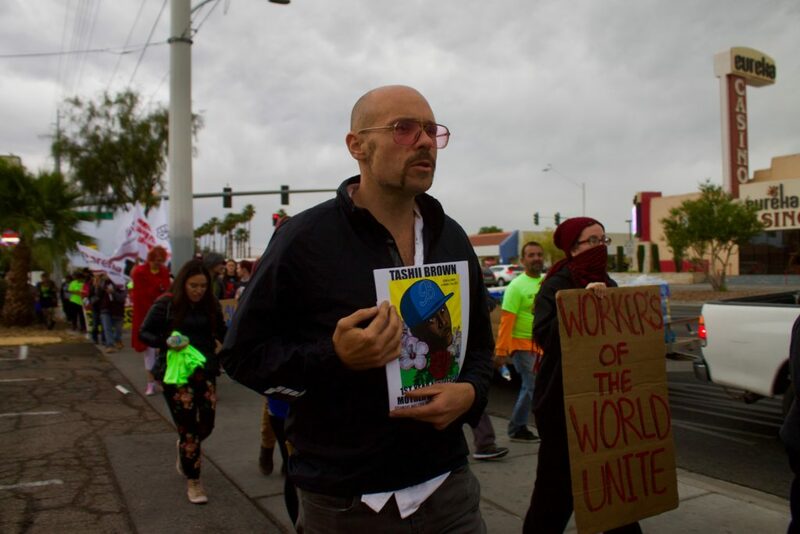 Despite the heavy rain, the Las Vegas community came out to march in the 12th Annual Las Vegas May Day Rally & March. Ben, a film festival producer, holds the flyer for the Tashii Brown vigil scheduled for Mother’s Day, May 13. May 1 2018, Las Vegas, NV. Alexander Hawkins, a local organizer, holds a portrait of Tashii Brown, while actively listening to impacted families speak about their loved ones and their cases during the first Mother’s Day vigil for Tashii Brown. Las Vegas, NV, May 13, 2018. Metro Officer Lopera killed my son, Tashii. Tashii was defenseless on his back before Lopera used a taser seven times on him. When that wasn’t enough, Lopera started beating Tashii with a fist on his head. Not satisfied with the beating, Lopera choked Tashii to death and bragged to an officer that he “choked him out.” After killing my son in public, the grand jury secretly exonerated Lopera. Welcome to Vegas, where police can kill a defenseless human being, brag about it, and then get away scot free. I hope the public is as outraged as our family is at the killing of our son, father and brother. For no reason! No reason at all! Tashii was a good man. He did not deserve this. 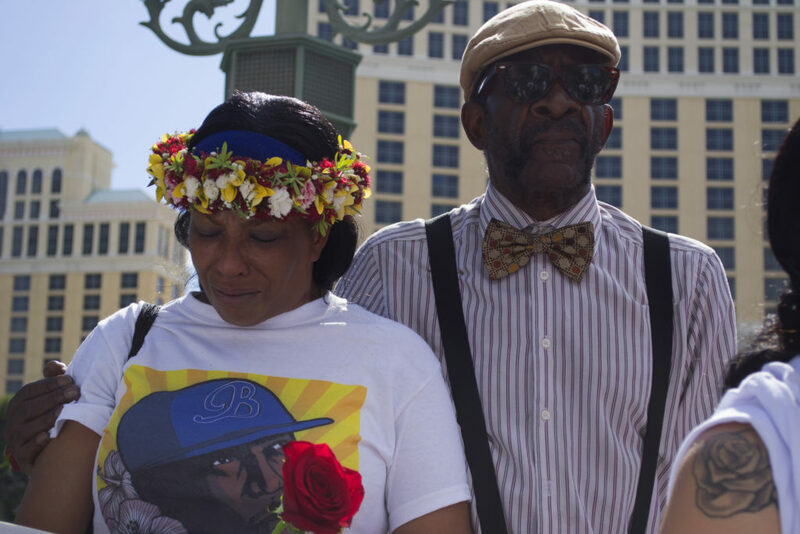 Families impacted by police violence convene at the Bellagio Fountains to support Trinita Farmer, the mother of Tashii Brown, for the first Mother’s Day vigil for Tashii Brown. From left to right: Petra Gonzalez-Wilson, widow of Rex Wilson, Halina Wilson, daughter of Rex Wilson, Aaron Wilson, son of Rex Wilson, Trinita Farmer, mother of Tashii Brown, Dominic Archibald, mother of Nathaniel Pickett, and Alma Chavez, mother of Rafael Olivas. Las Vegas, NV, May 13, 2018. Lagomarsino stated that he is committed to achieving justice for Tashii Brown and that the fight to hold Lopera accountable is not over. Trinita Farmer is comforted by a friend, at the first Mother’s Day vigil for her son, Tashii Brown, by the Bellagio Fountains. Las Vegas, NV, May 13, 2018. Family, friends and supporters of police violence victim Keith Childress, Jr. demand justice for his murder. His mother, Jacqueline Lawrence, lives in Phoenix, Arizona, which makes advocating for her son difficult, but she has started to meet other families impacted by police violence.